A look at the weekly chart of Cytori shows just how far, and rapidly it has fallen in 2014 since peaking over 3$ in February. With a weekly RSI of 16, the stock is well oversold and has been so for a few months now. 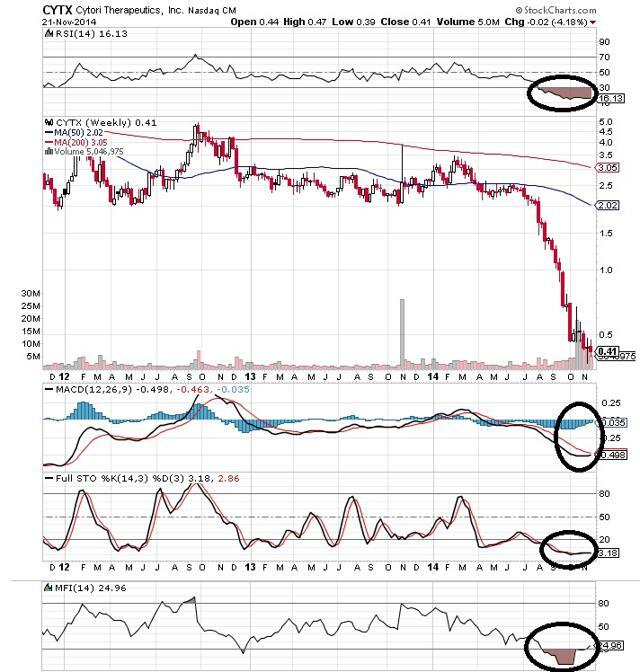 Other markers including the MACD, Stochastics and Money Flow Index indicate that this is likely a stock that is currently in the process (albeit a lengthy one) of bottoming out. Technically, the stock has ample upside room from current levels. Fas...some technicals from you ? Too bad the article is using dated material as technicals has indeed improved greatly and thus we are now at $ 0.43 vs the $ 0.41 in the charts provided from few weeks ago. Tax selling will be over at year end but the vote on Jan 6 may also be a event effecting the PPS and then ATHENA data. Otherwise its the R/S for sure....of course I believe its unavoidable anyway without a major partner deal. Clock is ticking !!! Small correction...weekly data is being used vs daily data in the charts provided....so is not dated material. I just looked at my charts on "the its stock" section of the page. Here I had technical analysis from a German Guru who´s own stock (which I had for ages too) is one of the shining stars of biotech. Oh well- I love the underdog apparently.. I read this Seeking Alpha article only a day or so ago. It looks like a DOV style write up.